The most common protein purification technique that we use is gel filtration (also called size exclusion chromatography). In gel filtration, proteins are separated by their size (or more correctly by their "Stokes radius", which is largely determined by their size and shape). 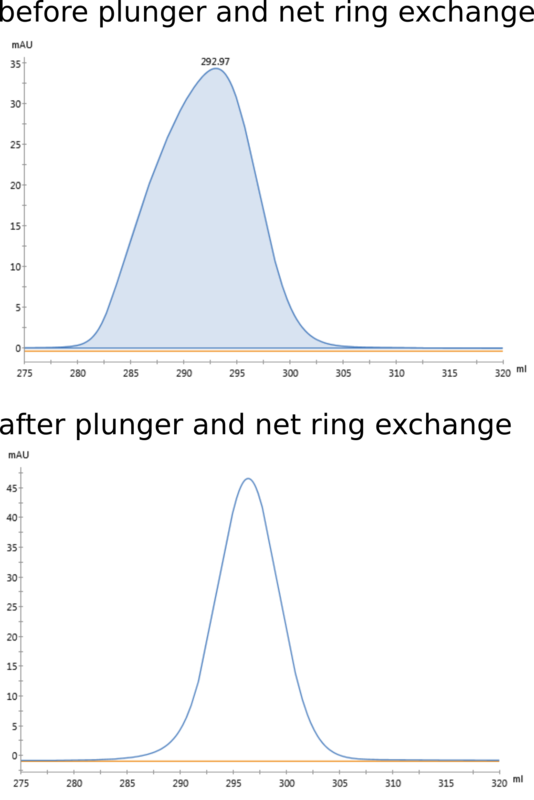 For gel filtration of large protein amounts, we bought GE Healthcare's HiLoad 26/60 Superdex 200 prep grade about 9 years ago (the 26/60 has been replaced by HiLoad 26/600, but both are almost identical). With this column you can very cleanly separate two proteins that have a size difference of 100%. Therefore it is suitable to separate monomeric from dimeric versions of the same protein. The columns "expiry date" was 2012-03. Our experience is that under proper handling, such a column can easily reach a life span of 10 to 15 years (we don't use it very often, we store it in 20% ethanol, if we don't need it for longer periods of time, we keep it at +4°C). Despite its outstanding performance and without any obvious reason, we experienced a drastic reduction of separation power in the end of last year with a substantial overlap of the dimeric and monomeric peak of our pet protein VEGF-C. We tested the column with the standard gel filtration column performance test (0.5 ml 2% acetone sample) and found that only about 1400 of the theoretical plates per meter (TP/m) of this columns were left (GE promises >13000 for the new column). 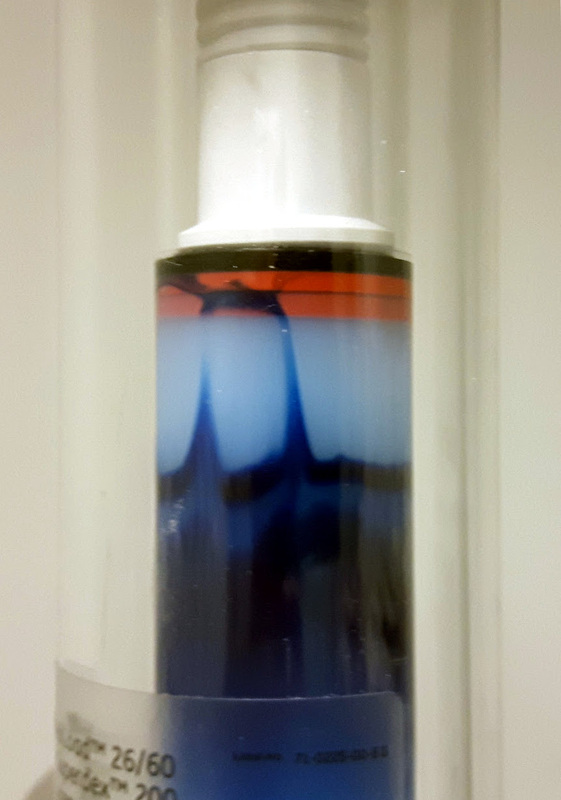 In order to identify the cause of the problem we injected a 20% bromophenol blue in 20% ethanol solution and we could observe that the problem was created at the top of the column where the sample entered the gel bed (see image above). 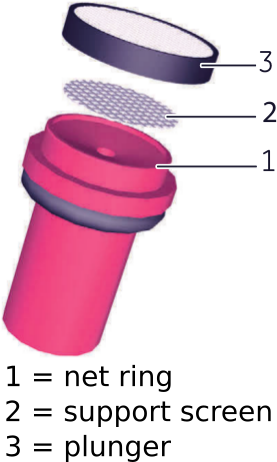 The plastic plunger (see image on the left) is covered at its bottom by a ring with a fine-meshed plastic net and at the connection between this net and the plunger, sample was leaking irregularly creating a large tailing (and therefore wide, asymmetric peaks). We exchanged the net ring against a spare part, but the situation did not improve at all, massive leakage still occurred. I suspected that the spare part was not good anymore as it had come together with the column and had aged loosing its plasticizer. It was very stiff and not flexible and already when pushing it onto the plunger, I suspected that it would not seal well enough. While we were waiting for a new package of new net rings, we tried to cut our own sealing from parafilm. That actually did improved the TP/m from 1400 to 2800, but we still could observe much leakage. When we finally exchanged both plunger and net ring against new spare parts, we measured about 17000 TP/m. The peak became symmetric and slim again which could be seen already by naked eye (image on the right). However, we were surprised that the leakage between the plunger still occurred (see below), albeit at a much lower rate and in a much more equal fashion. I wonder whether this "base" leakage is present also with entirely new columns. I don't know this because we did not test our column with any coloured solution when it was new. We only made the acetone test and a functional test with proteins from a gel filtration calibration kit from Sigma. And also the standard acetone test is not comparable to what we see now, because it was done on a different machine with different tubing (and that can influence the resolution power quite substantially). If new columns show also this base line leakage, then GE has still head space how to improve their column design and I wonder how much better the resolution could get if we could inject the sample in a more controlled fashion. Interestingly, GE Healthcare is a worldwide monopolist on these big columns (please correct me if I am wrong since these GE columns carry a hefty price tag of around 3000€). 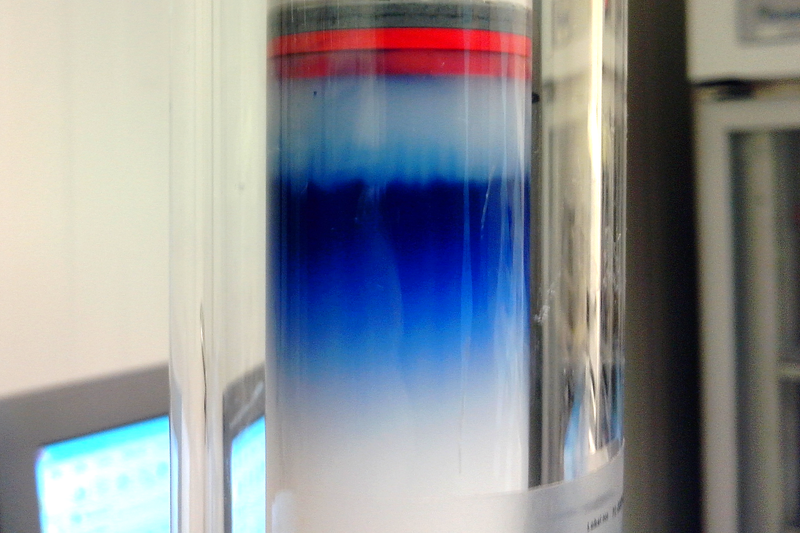 With smaller gel filtration columns, there is competition (e.g. Tosoh), but nobody except GE Healthcare offers 60-cm (or longer) gel filtration columns with such a high sample capacity (2-5 ml).